Once you’ve created a chatbot, you can publish it so that it’s available to selected people or groups, or to everyone in your domain. This lets users start a direct message with the bot or add it to a Room, by choosing it from the proposed recipient list as shown below. Users can also narrow the proposed recipient list by @mentioning the bot by name. 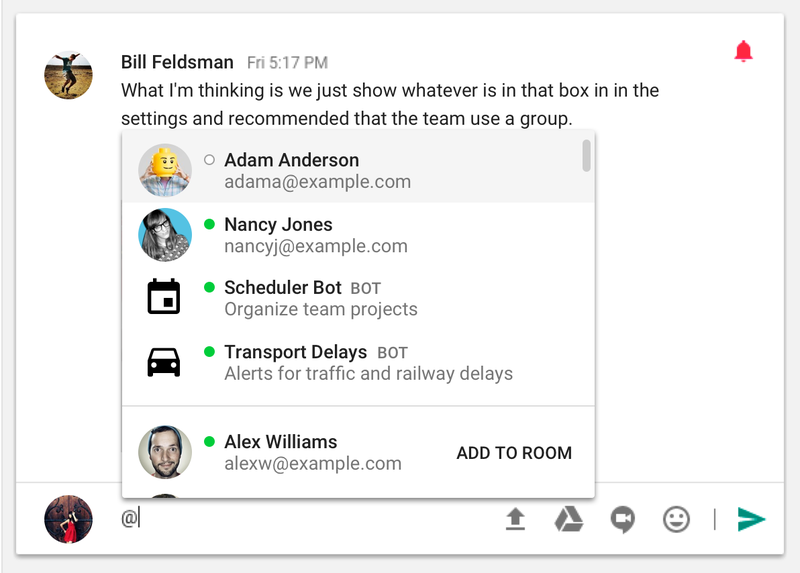 For example, if you publish a bot called “schedulerbot”, then when users in your domain type “@sch” then Hangouts chat will propose your bot as one of the autocomplete options. Use the button below to create a new project (or select an existing one) and add a service account to it. Give the service account the Project Owner role. Save the downloaded JSON key. Your bot can use this key to authenticate messages that it sends to spaces asynchronously. Open your project in the API Console. In the list of APIs, click Hangouts Chat API. Select the Configuration tab and enter the information for the bot, as described below. After you save this bot definition in the API Console, your bot will become available to the specified users in your domain. 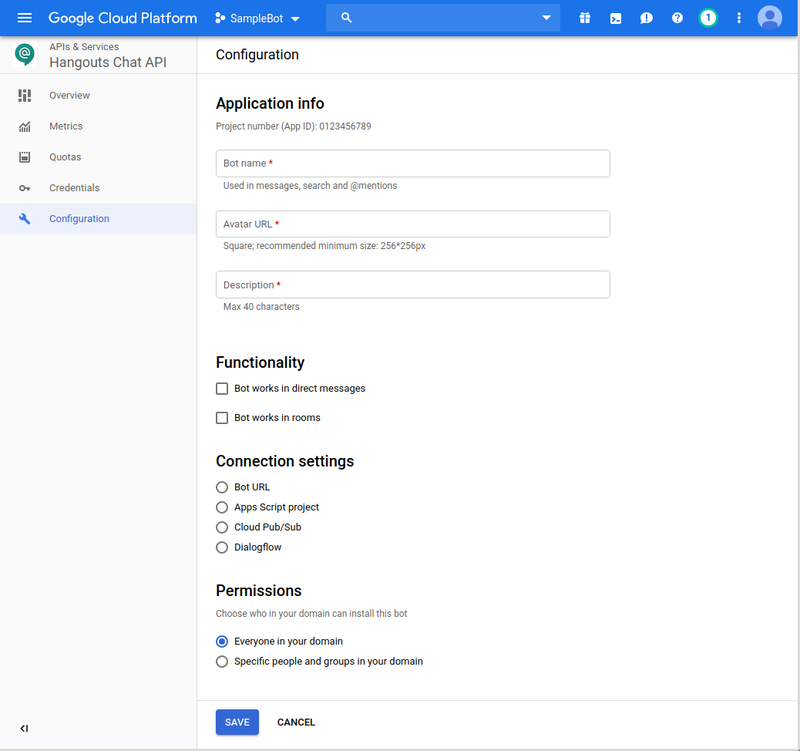 When you choose the configuration tab of the Hangouts Chat API, you will see a screen like the one shown below. At the top of the screen there is a Bot Status field that appears only after you've published your bot. This field lets you control whether the bot is Live or Disabled. Bot name This is the name that users can type to invoke your bot in autocomplete or in DMs. Avatar URL A square graphics image (e.g. PNG or JPEG), at least 128x128, that will appear as the avatar for your bot. Description Text that will appear below your bot's name. Bot works in rooms: Check this to enable bots to be triggered by name in chat rooms. Bot works in direct messages: Lets users send direct messages to the bot. Bot URL: Specifies the HTTPS endpoint where the bot implementation is hosted. Configuration URL Reserved for future feature. Permissions Controls whether the bot is visible to all members of your domain, or just to selected individuals or groups.